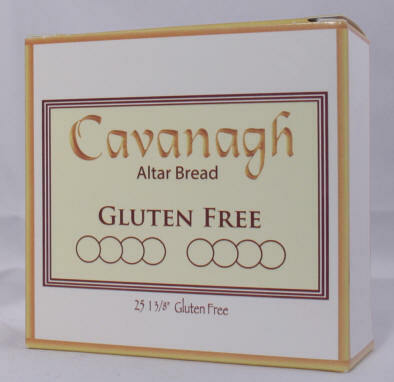 We are pleased to offer by far the best altar bread. All of our breads have a carefully molded sealed edge which prevent crumbs. They are baked of only pure wheat flour and water and are made strictly without additives. The breads are produced in the United States by the highly respected Cavanagh Company in their exceptionally clean and modern automated facility. The breads are sealed minutes after baking and are untouched by human hands. The packaging is superior to all other forms and many options are available to meet your individual requirements. Double the thickness of most normal breads. These breads are more wheaten and have three different incised designs which have a significance for one receiving in the hand. This large concelebration host has impressed lines for easy breaking into 24 pieces. This large, double thich bread has impressed lines to facilitate the breaking without crumbs into 69 pieces. 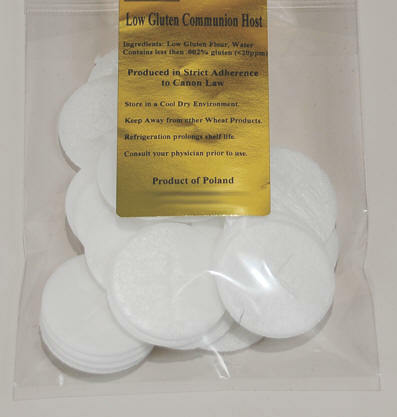 Gluten Free Host Ciborium Attachments- CLICK HERE! 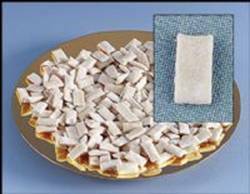 The gluten free wafers are made using: water, garbanzo bean flour, potato starch, tapioca flour, whole grain sweet white sorghum flour, fava bean flour and palm oil. The gluten content of our gluten free wafer is 6 parts per million. To be considered gluten free the gluten content has to be below 20 parts per million. The baking of the gluten free wafers is done in a dedicated bakery using positive air pressure to create a room that is totally free of contaminants. 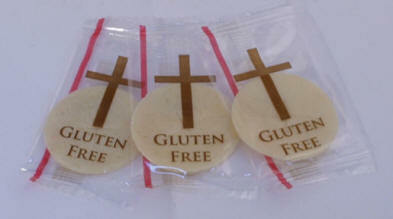 The equipment is also dedicated to the gluten free baking and is not used for regular altar bread production. They are packaged in boxes of 25 individually wrapped wafers to prevent cross contamination in transit and while stored. Shelf life is guaranteed for 1 year. Enjoy the tradition of Christmas wafers. Available in both pink and white. 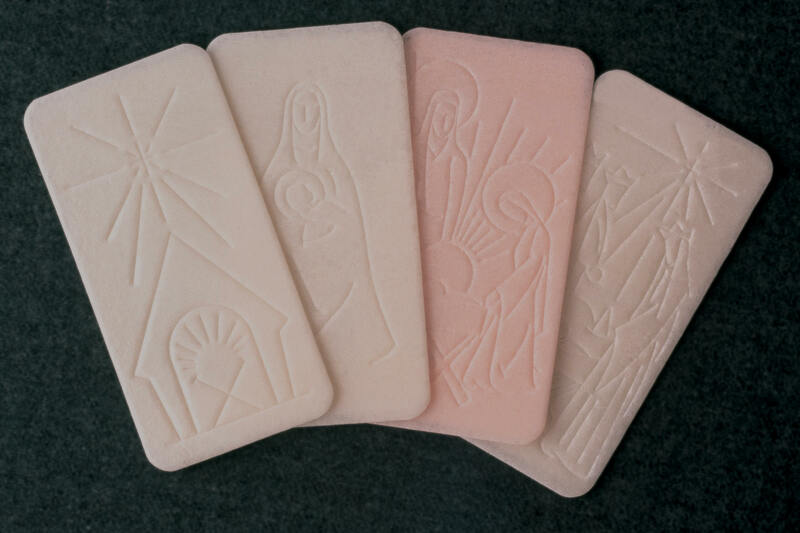 These seasonal wafers are available in four assorted designs and are packaged in sealed package of 100. Size 27/8" x 53/4". 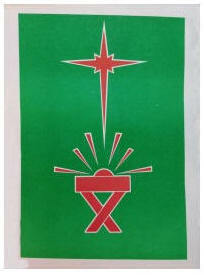 Also available- Christmas Wafer Envelopes (green/red) with meaningful description on backside. Catholic Supply is working hard to keep the cost as low as possible for you, our valued customers. We have increased our volume and that has helped us offset the rising costs. We have also worked with trucking companies to reduce the cost of transporting the wine from California to St. Louis. We hope you find our prices to be very competitive. Please give us a try! 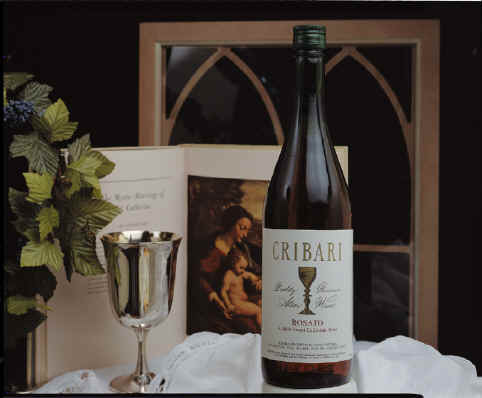 Since 1917, the Cribari Family has been recognized as a leader in providing sacramental wines to the reverend clergy. Their fine reputation has been earned through the quality of their wines- quality borne of care and meticulous attention to detail. These wines have enjoyed continuous ecclesiastical approbation by the Bishops of Fresno, California. All are prepared in full accordance with Canon Law. Cribari Quality Reserve Altar Wines have all the proper characteristics for the high purpose for which they are intended. The Cribari family's four generations of experience enable us to recommend these superior Altar Wines without qualification. Our wines are available in both 750 ml bottles and in 4 liter jugs. The jugs are 4 liter size and are sold at the same price as many other companies sell their 3 liter! We are happy to offer this and hope you enjoy the additional savings per liter! 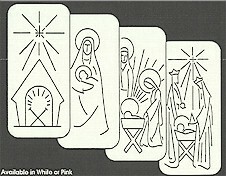 Ecumenical Daily Appointment Planners- CLICK HERE! CHURCH FURNISHINGS ON CONSIGNMENT- CLICK HERE!